To prepare the sauce, add all ingredients to a saucepan and bring to a boil over high heat. Remove from heat, and let sit in hot saucepan for 3 to 5 minutes. Chill in refrigerator for about 15 minutes or until cold. Prepare the chicken by heating oil in a large wok or sauté pan. Add ginger and garlic, and stir-fry briefly until cooked but not brown, about 30 seconds to 1 minute. Add chicken, and continue to stir-fry for 5 to 8 minutes. Add soy sauce, sesame oil (optional) and sesame seeds (optional), and return to a boil. Remove from heat, and cover with lid to hold warm in hot sauté pan. 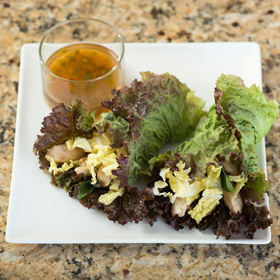 Assemble each wrap: Place one large red lettuce leaf on a plate. Add 1/2 cup chicken stir-fry, 1 basil leaf and 1/4 cup shredded cabbage, and fold together. Serve 2 wraps with 1/4 cup sauce. Serving size: 2 wraps, 1/4 cup sauce. Amount per serving: 242 calories, 10g total fat (2g saturated fat), 17g carbohydrates, 21g protein, 3g dietary fiber, 393mg sodium.